Photo contributed by Tony Ream. The Sons of Union Veterans Civil War, Post 14, Johnstown, PA.
1 ABLER, August Co. I, 54 P.V.I. 1 ADAMS, George W. Co. E. 6 O.I. 1 ADAMS, William Co. C, 98 P.V.I. 1 ALBAUGH, Joseph Co. C, 19 U.S.I. 1 ALEXANDER, John G. Co. B, 2 P.V. Bat. 1 ALTEMUS, M. S. Co. F, 55 P.V.I. 1 AMIGH, Resler Co. A, 55 P.V.I. 1 AMSLER, Carl Co. H, 10 P.V.I. 1 ANDERSON, A. Co. D, RIN. BAT. 1 ANDERSON, Benjamin P. Co. E, 54 P.V.I. 1 ANDERSON, Henry Co. H, 55 P.V.I. 1 ANDREWS, Joseph Co. E, 82 P.V.I. 1 ANKERMAN, William Co. C, 11 P.V.I. 1 ANSTRAW, Harrison Co. E, 11 P.V.I. 1 ARENTRUE, Samuel P. Co. G, 11 P.V.C. 1 ARENTRUE, William Co. A, 133 P.V.I. 1 ARNOLD, George W. Co. B, 4 P.V.R.C. 1 ARTHUR, John T. Co. F, 198 P.V.I. 1 ARTHUR, S. B. Co. F, 198 P.V.I. 1 ARTLEY, Jeremiah Co. D, 208 P.V.I. 1 ASHBRIDGE, James S. Co. C, 1 P.V.I. 1 ASHCOM, C. L. Co. F, 21 P.V.C. 1 AUMAN, L. H. Co. E, 171 P.V.I. 2 BACH, Theodore Co. A, 107 O.V.I. 1 BADER, Peter Co. G, 3 P.V.I. 2 BAGLEY, James Co. K, 5 P.V.H.A. 1 BAILEY, Samuel C. Co. H, 125 P.V.I. 2 BALSINGER, S. P. Co. H, 1 P.V.C. 2 BARCLAY, William Co. E, 54 P.V.I. 2 BARKER, E. V. Co. H, 23 ME. I. 2 BARKER, F. H. Co. C, 209 P.V.I. 1 BARKHEIMER, M. H. Co. K, 18 P.V.C. 1 BARNETT, Jeremiah Co. F, 61 P.V.I. 1 BARNHART, Henry Co. G, 3 P.V.I. 1 BARRINGER, John Co. A, 133 P.V.I. 1 BATES, William H. Co, K, 18 P.V.C. 10 BAUMER, Louis Co. F, 3 PA Infty. 2 BAYNER, Franklin Co. F, 138 P.V.I. 2 BEAM, Jones Co. A, 51 P.V.I. 1 BEARD, Thomas Co. K, 8 MO. C.
1 BEAT, Robert H. Co. G, 1 N.Y.L.A. 1 BECK, Andrew Co. K, 206 P.V.I. 2 BECK, William H. Co. I, 3 P.V.R.C. 1 BEE, David Co. G, 3 P.V.I. 1 BEEMISH, Peter Co. G, 3 P.V.I. 1 BELTZ, George Co. D, 5 P.V.H.A. 1 BELTZNER, August Co. F, 132 P.V.I. 2 BENFORD, David R. Co, I, 93 P.V.I. 1 BENFORD, James Co. A, 10 P.V.R.C. 1 BENNETT, Elisha Co. C, 1 Fat, U.S.C. 1 BENNETT, P. J. Co. F, 133 P.V.I. 2 BENSON, Thomas Co. I, 198 P.V.I. 1 BERKEBILE, George W. Co. F, 54 P.V.I. 2 BERKEY, A. J. Co. H, 187 P.V.I. 1 BERKEY, Abram Co. C, 52 P.V.I. 1 BERRY, John Co. A, 84 P.V.I. 2 BEST, Elias H. Co. G, 135 P.V.I. 1 BINGHAM, Uriah Co. G, 192 P.V.I. 1 BIRD, Edward Co. D, 5 P.V.H.A. 1 BLAISDELL, I. C. Co. G, 5 Mass V.I. 1 BLAISDELL, J. C. Co. G, 5 Mass. V.M. 1 BLOCK, Henry Co. A, 54 P.V.I. 1 BLOUGH, A. W. Co. H, 171 D.M. 2 BLOUGH, Cyrus Co. K, 149 P.V.I. 2 BLOUGH, Henry D. Co. K, 206 P.V.I. 2 BLOUGH, J. D. Co. H, 171 D.F.M. 1 BLOUGH, Jacob W. Co. H, 171 P.V.I. 1 BLOUGH, Joseph W. Co. C, 54 P.V.I. 1 BOLE, Samuel C. Co. E, 4 P.V.C. 1 BOLER, Gilson Co. F, 198 P.V.I. 1 BOWDEN, William Co. K, 138 P.V.I. 1 BOWER, Emanuel Co. G, 149 P.V.I. 1 BOWER, Henry Co. M, 12 P.V.C. 2 BOWERS, Jacob Co. I, 206 P.V.I. 1 BOWERS, Josiah Co. B, 54 P.V.I. 1 BOWSER, Isaac B. Co. A, 133 P.V.I. 3 BOYER, Barney B. Co. G, 54 P.V.I. 2 BOYER, Fred Co. I, 206 P.V.I. 2 BOYER, George Co. K, 136 P.V.I. 1 BOYER, Leonard Co. H, 135 P.V.I. 10 BOYER, Martin Co. D, 54 PA. Infty. 1 BOYER, Solomon Co. H, 11 P.V.I. 1 BRACKEN, James S. 1 N.J.A. 2 BRACKEN, James S. Co. F, 87 P.V.I. 1 BRACKEN, William Co. H, 12 P.V.R.C. 1 BRAZIL, John Co. G, 11 P.V.C. 1 BRENDLINGER, D. W. Co. H, 206 P.V.I. 1 BRICKER, John G. Co. A, 10 P.V.R.C. 1 BRINDLE, Jacob Co. A, 2 U.S.C. 2 BRINEY, L. L. Co. G, 193 P.V.I. 10 BROWN, John Co. I, 4 N.J. Infty. 1 BROWN, Uriah K. Co. H, 148, P.V.I. 1 BRUBAKER, A. S. Co. I, 20 P.V.C. 1 BRYAN, David R. Co. A, 3 P.V.I. 10 BRYAN, J. Dent Co. B, 1st. PA. CAV. 2 BURDICK, Thomas E. Co. D, 12 R.I.I. 1 BURGESS, William Co. C, 81 P.V.I. 1 BURKETT, John Co. D, 1 P.V.H.A. 1 BUTLAND, Charles Co. H, 10 P.V.R.C. 1 BUTLER, Caleb Co. G, 192 P.V.I. 2 BUTLER, David Co. G, 11 P.V.C. 1 BUTLER, Nathaniel Co. A, 54 P.V.I. 1 BYRODE, O. W. 12 O. Bat. 2 CAMPBELL, Jacob M. Co. G, 3 P.V.I. 2 CANAN, S. Dean Co. K, 136 P.V.I. 2 CARDIFF, Ebenezer Co. B, 54 P.V.I. 2 CARMICHAEL, Samuel Co. K, 67 P.V.I. 2 CARNEY, Theodore M. Co. B, 56 P.V.I. 2 CARRELL, Thomas A. Co. A, 133 P.V.I. 2 CARRELL, William H. Co. A, 54 P.V.I. 2 CASSIDY, Michael Co. M, 62 P.V.I. 2 CHAPIN, Philip E. Co. I, 15 Conn. I.
Co. L, 2 Conn. H. A. 2 CHAPMAN, H. L. 123 P.V.I. 2 CHAPPLE, J. Q. A. Co. K, 10 P.V.R.C. 2 CHASE, G. W. Co. D, 199 P.V.I. 2 CHILCOAT, J. W. Co. B, 110 P.V.I. 2 CHRIST, John Co. K, 55 P.V.I. 2 CLARK, George Co. M, 12 P.V.C. 2 CLARK, Oliver Co. C, 2 P.V.I. 2 CLARK, Samuel Co. M, 12 P.V.C. 2 CLAWSON, Ross Co. K, 177 P.V.I. 2 CLIFTON, James H. Co. F, 46 P.V.I. 2 CLINGER, George Co. M, 12 P.V.C. 2 COHO, John Co. I, 10 P.V.I. 2 COLDENBAUGH, Jacob Co. D, 142 P.V.I. 2 COLEMAN, Robert Co, K, 177 P.V.I. 2 COLERAN, Philip Co. C, 55 P.V.I. 2 COLLIER, Daniel W. Co. A, 1 P.V.R.C. 2 COLPETZER, Emanuel Co. A, 49 P.V.I. 2 COLVER, Otis E. Co. E, 157 N.Y.I. 2 COMMERS, William A. Co. B, 107 P.V.I. 2 CONDON, J. Frank Co. A, 133 P.V.I. 2 CONSTABLE, George W. Co. G, 53 P.V.I. 2 CONSTABLE, Henry Co. A, 51 P.V.I. 2 CONSTABLE, Philip E. Co. I, 205 P.V.I. 2 COOK, Charles Co. D, 39 U.S.I. 2 CORL, Aaron Co. K, 107 P.V.I. 2 CORNER, George Co. G, 192 P.V.I. 2 COULTER, D. W. Co. B, 17 P.V.I. 2 COVER, B. F. Co. D, 5 P.V.H.A. 2 COZZEN, Anderson Co. D, 1 L.A.
2 CRAMER, Wilson Co. B, 133 P.V.I. 2 CRAVEN, Robert Co. A, 61 P.V.I. 2 CULLINGHAM, Clark Co. I, 11 P.V.I. 2 CUPPLES, Thomas H. Co. G, 16 P.V.C. 2 CUSTER, Emanuel Co. H, 54 P.V.I. 2 CUSTER, F. S. Co. H, 206 P.V.I. 2 CUSTER, J. P. Co. F, 198 P.V.I. 2 CUSTER, John Co. F, 198 P.V.I. 2 CUSTER, Philip F. Co. E, 171 D. W.
3 DAVIS, David M. Co. F, 198 P.V.I. 3 DAVIS, Owen W. Co. A, 133 P.V.I. 3 DAVIS, Thomas F. Co. G, 132 P.V.I. 3 DAVIS, W. P. Co. I, 193 P.V.I. 2 DECKER, John L. Co. K, 3 P.V.I. 3 DECKERT, F. S. Co. E, 139 P.V.I. 3 DELANEY, George W. Co. H, 57 P.V.I. 3 DELLETT, William F. Co. L, 13 P.V.C. 3 DEVINE, Henry Co. D, 1 Bat. L.A.
2 DEVINE, John C. Co. C, 187 P.V.I. 3 DEVINE, William F. Co. K, 138 P.V.I. 3 DEVLIN, Theo. F. Co. A, 55 P.V.I. 3 DIAS, T. C. Co. E, 2 Bat. P.V.I. 2 DIAS, T. D. Co. D, 11 P.V.I. 3 DIBERT, Samuel Co. C, 19 U.S.I. 3 DIEHL, George C. Co. F, 77 P.V.I. 3 DIEHL, Samuel Co. E, 125 P.V.I. 3 DIEHLE, August Co. F, 198 P.V.I. 3 DIGNAN, Robert Co. H, 22 P.V.C. 3 DIMOND, Robert F. Co. F, 6 P.V.H.A. 3 DIPPLE, August Co. F, 198 P.V.I. 3 DISHONG, David Co. E, 56 P.V.I. 3 DISHONG, Peter Co. B, 133 P.V.I. 3 DORRIS, Christian Co. D, 5 P.V.H.A. 3 DRIPPS, S. W. Co. H, 12 P.V.R.C. 3 DULL, William Co, K, 6 P.V.H.A. 3 DUNCAN, James M. Co. K, 3 P.V.I. 2 DUNFEE, William H. Co. G, 3 P.V.H.A. 3 DYSERT, F. S. Co. K, 3 P.V.I. 3 EDMISON, S. P. Co. I, 55 P.V.I. 3 EDWARDS, David R. Co. A, 54 P.V.I. 3 EDWARDS, William Co. G, 3 P.V.I. 3 EICHENSICKER, Henry Co. A, 61 P.V.I. 3 ELDER, Cyrus Co. A, 10 P.V.I.R. 3 ELDER, Virgil C. Co. A, 10 P.V.I. 3 ELLSWORTH, Charles Co. F, 198 P.V.I. 3 ETCHINSON, John Co. F, 198 P.V.I. 3 EVANS, Henry Co. B, 12 P.V.C. 3 FAIRFAX, G. W. Co. H, 46 U.S.I. 3 FALOON, David Co. B, 133 P.V.I. 3 FALSTICK, Josiah �Co. C, 198 P.V.I. 3 FEARLE, Thomas J. Co. C, 45 P.V.I. 3 FEENEY, John Co. C, 55 P.V.I. 3 FELTON, Samuel Co. H, 11 P.V.C. 3 FENN, John L. Co. D, 5 P.V.H.A. 3 FENTEMAN, W. H. Co. B. 2 P.V.I. 3 FERNER, William Co. G, 93 P.V.I. 3 FESLER, Danial Knapp's Bat. E.
3 FETTERMAN, Edward Co. E, 67 P.V.I. 3 FETZER, M. J. Co. C, 76 P.V.I. 3 FINDLAY, R. H. Co. A, 54 P.V.I. 3 FINLEY, James G. Co. H, 63 P.V.I. 3 FISCH, Matthew Co. L, 5 CAL.I. 3 FISHER, Alexander Co. E, 211 P.V.I. 3 FISHER, Andrew Co. D, 55 P.V.I. 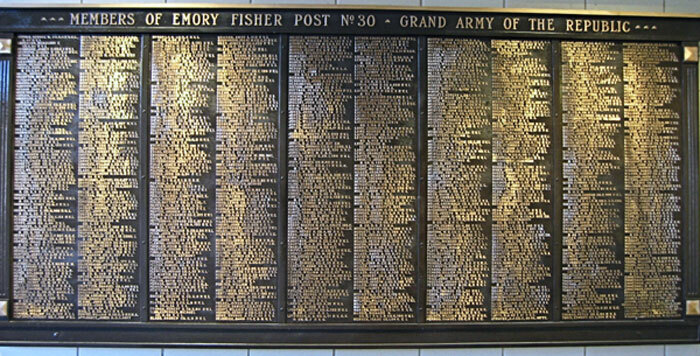 3 FISHER, John Co. B, 54 P.V.I. 3 FITE, J. B. Co. F, 3 P.V.I. 3 FIX, Martin Co. E, 54 P.V.I. 3 FLACK, Robert Co. I, 5 VA.I. 3 FLECK, J. V. Co. G, 93, P.V.I. 3 FLECK, Joseph Co. H, 46 N.Y.I. 3 FLEMING, Joseph M. Co. F, 21 P.V.C. 3 FLOWERS, Josiah Co. A, 55 P.V.I. 3 FOCKLER, Adam G. Co. A, 54 P.V.I. 3 FOCKLER, Jacob M. Co. A, 133 P.V.I. 3 FORBER, David Co. D, 5 P.V.H.A. 3 FOSTER, Andrew 31 N.Y.I. 3 FRANKHOUSER, Anthony Co. C, 19 U.S.I. 3 FREDERICK, William H. Co. A, 54 P.V.I. 3 FRESH, Abraham Co. I, 54 P.V.I. 3 FREW, William Co. C. 1 N.J.V.I. 3 FULLMER, Henry Co. H, 67 P.V.I. 3 FULTON, Alfred Co. F, 125 P.V.I. 3 FULTON, David Co. F, 21 P.V.C. 3 FUNK, John Co. I, 54 P.V.I. 3 FURMAN, A. J. 7 P.V.I.R. 3 GAGEBY, George W. Co. G, 3 P.V.I. 4 GAGEBY, James H. Co. K, 3 P.V.I. 4 GARDNER, John P. Co. F, 198 P.V.I. 4 GEDDIS, George Co. K, 136 P.V.I. 4 GEER, James H. Co. A, 133 P.V.I. 4 GEISEL, Samuel Co. B, 54 P.V.I. 4 GEORGE, C. C. Co. B, 139 P.V.I. 4 GERBER, John C. Co. C, 54 P.V.I. 4 GERSTING, August Co. F, 198 P.V.I. 4 GILBERT, Frank B. Co. D, 53 O.V.I. 3 GINDLESPERGER, Michael Co. H, 54 P.V.I. 4 GIVEN, William Co. F, 198 P.V.I. 3 GLASS, Andrew Co. G, 3 P.V.I. 3 GLASS, Jacob A. Co. K, 3 P.V.I. 4 GLASS, John Co. H, 10, P.V.I. 4 GLENN, R. H. Co. B, 63 P.V.I. 4 GLITCH, Conrad Co. F, 198 P.V.I. 4 GODARD, J. C. Co. F, 206 P.V.I. 4 GOLDSTEIN, E. L. U.S.N. 4 GOUGHNOUR, A. Co. F, 3 P.V.I. 4 GOUGHNOUR, Aaron Co. D, 93 P.V.I. 4 GOUGHNOUR, Benjamin Co. G, 11 P.V.C. 4 GOUGHNOUR, Isaac D. Co. A, 11 P.V.C. 4 GRAHAM, Amos L. 112 P.V.I. 4 GRAHAM, James B. Co. I, 206 P.V.I. 10 GRAHAM, Patrick Co. E, 54 PA. Infty. 3 GRAHAM, Robert S. Co. E, 54 P.V.I. 4 GREEN, James A. Co. B, 147 P.V.I. 4 GREGORY, Stephen B. Co. C, 18 P.V.I. 10 GROSS, G. D. Co. C, 16 PA. Infty. Co. B. 11 Cav. 4 GULL, John Co. K, 18 P.V.C. 4 HADDIN, George T. Co. F, 55 P.V.I. 4 HADDLE, J. W. Co. K, 1 MD. V.I. 4 HAGINS, John Co. D, 205 P.V.I. 5 HALE, Elijah Co. B, 192 P.V.I. 4 HAMILTON, David Co. H, 10 P.V.I.R. 5 HAMILTON, Joseph Co. D, 5 P.V.H.A. 4 HANLEY, Levi Co. H, 15 P.V.I. 5 HARRIS, Isaac Co. D, 5 P.V.H.A. 4 HARSHBERGER, Jacob Co. I, 22 P.V.I. 4 HART, Alex. N. Co. H, 12 P.V.I.R. 5 HASSETT, John F. Co. B, 22 P.V.I. 4 HASSINGER, John G. Co. B, 101 P.V.I. 4 HAWTHORN, William 15 Ind. Bat. 4 HEADRICK, David Co. F. 8 P.V.I. 4 HEDRICK, Charles C. Co. G, 11 P.V.C. 4 HEIDINGSFELTER, George Co. F, 198 P.V.I. 5 HEISER, George Co. K, 136 P.V.I. 4 HELSEL, Daniel Co. A, 10 P.V.I. 4 HELSEL, Hiram Co. F, 21 P.V.C. 5 HENDRICKS, John A. Co. I, 11 P.V.I.R. 5 HERDMAN, John Co. D, 1 P.V.H.A. 5 HERRINGTON, James 54 P.V.I. 4 HERTZINGER, Philip Co. F, 138 P.V.I. 4 HESLOP, Alfred Co. B, 1 Cal. V.C. 4 HESS, Jacob M. Co. K, 136 P.V.I. 5 HICKMAN, Sylvester Co. I, 22 P.V.C. 4 HICKS, William A. Co. D, 12 Ind. V.I. 4 HIGGINS, Jacob 1 P.V.C. 5 HIGSON, John Co. I, 35 N.Y.I. 4 HILDEBRAND, David Co. F, 8 P.V.C. 4 HILDEBRAND, J. A. Co. A, 56 P.V.I. 4 HILL, Cornelius Co. C, 19 U.S.I. 4 HILL, Daniel Co. E, 54 P.V.I. 4 HILL, John E. Co. F, 194 P.V.I. 4 HITE, David Co. G, 101 P.V.I. 4 HITE, Henry J. Co. K, 3 P.V.I. 4 HITE, Jacob A. Co. H, 171 P.V.I. 4 HOFF, Lawrence C. Co. D, 3 MD. P.H.D. 4 HOFFMAN, Henry H. Co. K, 61 P.V.I. 4 HOFFMAN, Milton Co. H, 54 P.V.I. 5 HOFFMAN, Peter P. Co. K, 206 P.V.I. 4 HOLLFELDER, John Co. C, 93 P.V.I. 4 HOOD, Lewis Co. B, 182 P.V.I. 4 HOOVER, Samuel Co. A, 110 P.V.I. 5 HOPKINS, William Co. A, 133 P.V.I. 4 HORNER, D. J. Co. K, 136 P.V.I. 4 HORNER, Henry J. Co. C, 54 P.V.I. 5 HORNER, Sylvester Co. F, 198 P.V.I. 4 HORNER, William C. Co. G, 93 P.V.I. 4 HORNER, William F. Co. F, 21 P.V.C. 5 HORNER, William H. Co. A, 51 P.V.I. 4 HORRELL, Irwin Co. D, 5 P.V.H.A. 4 HORROCKS, John H. Co. F, 21 P.V.C. 4 HOUPT, William F. Co. A, 10 P.V.I.R. 4 HOWARD, David Co. B, 133 P.V.I. 4 HOWE, John W. Co. E, 54 P.V.I. 4 HOWE, Thomas J. Co. C, 55 P.V.I. 4 HUBACH, Fred Co. G, 28 Mass. V.I. 4 HUBER, Lewis Co. F, 198 P.V.I. 5 HUBER, W. R. 11 P.V.I. 5 HUDSON, John Co. D, 78 P.V.I. 4 HUGHES, John W. Co. H, 14 P.V.I. 5 HUHNS, Paul Co. G, 46 P.V.I. 4 HUMMEL, Joseph R. Co. E, 54 P.V.I. 4 HUMPHREY, R. J. Co. H, 83 P.V.I. 5 HURDMAN, David Co. K, 110 P.V.I. 4 HUSTON, Josiah C. Co. K, 177 P.D.M. 5 INGLERT, John Co. E, 54 P.V.I. 5 INSCHO, John S. Co. C, Ind. V.I. 5 INSCHO, William E. Co. K, 136 P.V.I. 5 IRVIN, Edward Co. I, 206 P.V.I. 5 IRWIN, Isaac A. Co. F, 68 P.V.I. 5 JACKSON, Joseph Co. K, 136 P.V.I. 5 JACKSON, Thomas Co. D, 6 Conn. V.I. 5 JAHN, Edward Co. K, 93 P.V.I. 5 JAMES, Jacob Co. A, 54 P.V.I. 5 JENKINS, Joseph Co. F, 205 P.V.I. 5 JESSEN, James C. Co. I, 194 P.V.I. 5 JOHNSTON, Robert Co. C, 3 P.V.I. 5 JONES, D. J. Co. A, 2 Bat. Em. 5 JONES, John S. Co. A, 54 P.V.I. 5 JONES, Lewis R. 5 A.C.
5 JONES, Philip Co. A, 11 P.V.I. 5 JONES, Thomas D. Co. A, 11 P.V.I.R. 5 JONES, W. R. 97 P.V.I. 5 JONES, William J. Co. K, 5 P.V.H.A. 5 JUDY, Samuel Co. A, 11 P.V.R.C. 10 KALTENBAUGH, Jacob Co. D, 142 PA. Infty. 5 KAUFFMAN, J. B. Co. E, 54 P.V.I. 5 KAUFFMAN, John H. Co. E, 54 P.V.I. 5 KAYLER, Charles Co. A, 88 P.V.I. 5 KEARNEY, Zephaniah Co. B, 133 P.V.I. 5 KEEDY, Walter H. Co. A, Coles Ind. C.
5 KEGG, Nathaniel Co. E, 138 P.V.I. 5 KELLER, William Co. G, 19 U.S.I. 5 KELLEY, George W. Co. B, 83 P.V.I. 5 KELLS, Fred Co. F, 21 P.V.C. 5 KELLY, Stephen S. Co. K, 18 P.V.C. 5 KEMERER, Adam Co. D, 5 P.V.H.A. 5 KEYSER, Alexander Co. H, 211 P.V.I. 5 KIDD, Joshua Co. H, 13 P.V.C. 5 KILLEN, Franklin Co. H, 206 P.V.I. 5 KILLER, William B. Co. E, 67 P.V.I. 5 KIMMELL, T. R. Co. H, 10 P.V.I. 5 KING, Dorsey Co. A, 133 P.V.I. 5 KINKEAD, D. H. A. Bat. Em. 5 KINNEY, A. P. Co. A, 9 P.V.C. 5 KINSEY, B. F. Co. K, 206 P.V.I. 5 KINSEY, Peter Co. K, 55 P.V.I. 5 KLINE, Henry L. Co. G, 61 P.V.I. 5 KNABLE, Gerome B. 63 VET. 5 KNIPPLE, Andrew J. Co. C, 19 P.V.C. 5 KNOBLESPIES, Fidel Co. B, 74 P.V.I. 5 KOONTZ, Alex. Co. A, 10 P.V.I. 5 KRAMER, William A. Co. F, 1 W.Va.L.A. 5 KROUSE, John Co. M, 12 P.V.C. 5 KUHN, Henry H. Co. A, 10 P.V.I. 5 KUNTZ, Adam Co. F, 21 P.V.C. 5 KUNTZ, Chauncy F. Co. A, 133 P.V.I. 5 KUNTZ, George W. Co. A, 133 P.V.I. 5 KUNTZ, Noah Co. D, 142 P.V.I. 5 KUNTZ, Samuel Co. F, 198 P.V.I. 6 KUTHER, Charles O. Co. F, 198 P.V.I. 5 KYLE, Samuel Co. E, 13 P.V.C. 6 LAMB, George S. Co. B, 133 P.V.I. 6 LAMBERT, Joseph Co. G, 22 P.V.C. 6 LANE, Henry Co. G, 11 P.V.C. 6 LAPE, Aaron Co. F, 198 P.V.I. 6 LAPE, Henry Co. D, 4 P.V.C. 6 LAPE, Philip Co. G, 93 P.V.I. 5 LARDIN, John C. Co. H, 12 P.V.I. 6 LAUFFER, Valentine Co. A, 55 P.V.I. 10 LAUGHRY, James F. Co. C, 11 PA. Cav. 6 LAUGHRY, T. C. Co. F, 74 P.V.I. 6 LAUNTZ, Richard Co. C, 54 P.V.I. 6 LAVELY, Jeremiah 113 P.V.I. 6 LAVELY, John Co. F, 21 P.V.C. 6 LAYTON, Aaron Co. D, 133 P.V.I. 6 LEADBEATER, Thomas Co. F, 21 P.V.C. 5 LEE, Samuel Co. K, 137 P.V.I. 6 LENHART, John H. Co. K, 3 P.V.I. 6 LESLIE, William Co. C, 11 P.V.I. 6 LEVERGOOD, William H. Co. A, 133 P.V.I. 6 LEWIS, Charles A. Co. D, 133 P.V.I. 6 LIGHTENBERGER, Lewis Co. E, 54 P.V.I. 5 LIGHTNER, Jacob Co. A, 133 P.V.I. 6 LINDT, Henry Co. D, 11 N.J.I. 6 LINTON, John P. Co. F, 3 P.V.I. 6 LITZ, Thomas R. Co. F, 21 P.V.C. 5 LITZINGER, C. B. Co. A, 11 P.V.R.C. 6 LITZINGER, Robert Co. A, 11 P.V.I.R. 6 LIVINGSTON, David Co. C, 52 P.V.I. 6 LLOYD, E. B. Co, K, 55 O.I. 6 LOHR, Aaron Co. D, 5 P.V.H.A. 6 LOHR, Charles Co, K, 5 P.V.H.A. 6 LOHR, William J. Co. D, 34 Ill.V. 6 LOVE, George H. 127 P.V.I. 6 LUTHER, John A. Co. D, 6 P.V.H.A. 6 LYNCH, John D. Co. A, 130 P.V.I. 7 MAKIN, Abram L. Co. H, 192 P.V.I. 6 MAKIN, Archibald Co. I, 93 P.V.I. 6 MAKIN, Theodore Co. C, 54 P.V.I. 7 MALOY, Hugh Co. B, 133 P.V.I. 6 MALOY, John Co. G, 10 P.V.I. 7 MANGUS, Abram Co. B, 12 U.S.I. 6 MANGUS, Gabriel Co. G, 11 P.V.C. 7 MANGUS, George B. Co. D, 54 P.V.I. 6 MANGUS, Jacob Co. F, 21 P.V.C. 6 MANGUS, Joseph J. Co. K, 136 P.V.I. 6 MARDIS, Richard W. Co. B, 1 P.V.C. 6 MARDIS, Samuel Co. F, 2 P.V.I. 6 MARKEY, Thomas J. Co. B, 133 P.V.I. 7 MARLETT, Robert L. Co. I, 54 P.V.I. 6 MARSH, Uriah Co. E, 11 P.V.I.R. 7 MASTERS, Samuel Co. H, 54 P.V.I. 6 MAYHEW, Edward Co. L, 9 P.V.C. 7 McATEER, W. W. Co. K, 46 P.V.I. 7 McBRIDE, John Co. A, 54 P.V.I. 7 McBRIDE, Patrick C. U.S.N. 7 McBROOM, John Co. G, 206 P.V.I. 7 McCLENEHAN, S. Co. H, 49 P.V.I. 7 McCLURE, Anson Co. D, 49 P.V.I. 7 McCONNELL, Thomas H. Co. D, 205 P.V.I. 7 McCUNE, John Co. A, 54 P.V.I. 7 McCURDY, John Co. K, 136 P.V.I. 7 McELCARR, Nimrod Co. B, 133 P.V.I. 7 McFEATERS, William L. Co. I, 206 P.V.I. 7 McKEE, Hugh C. Co. G, 76 P.V.I. 7 McKEE, William Co. K, 136 P.V.I. 7 McKENNA, Francis Co. G, 2 Cal. V.I. 7 McLAUGHLIN, D. G. Co. A, 133 P.V.I. 7 McLAUGHLIN, William Co. C, 55, P.V.I. 7 McMILLEN, J. C. Co. B, P.V.C. 7 McMILLEN, John A. Co. I, 211 P.V.I. 7 McPOLAND, William Co. D, 9 MD. V.I. 7 McSTEEN, William H. Co. K, 46 P.V.I. 6 MEELEY, James F. Co. F, 2 P.V.I.R. 6 MENSER, Isaac Co. I, 54 P.V.I. 6 MERRITTS, C. C. Co. E, 155 P.V.I. 6 MESSENGER, John C. Co. F, 194 P.V.I. 7 MEYER, Christian Co. M, 12 P.V.C. 6 MEYER, John G. Co. F, 198 P.V.I. 6 MEYER, Josiah Co. G, 61 P.V.I. 6 MEYERS, Azariah H. Co. D, 195 O.I. 7 MICHAELS, Wesley P. Co. D, 11 P.V.C. 6 MILLER, Alex. Co. K, 136 P.V.I. 6 MILLER, Amos A. Co. A, 61 P.V.I. 7 MILLER, Jacob R. Co. F, 198 P.V.I. 6 MILLER, John� Co. F, 198 P.V.I. 6 MILLER, John A. Co. D, 5 P.V.H.A. 6 MILLER, John A. Co. B, 190 P.V.I. 6 MILLER, Joseph Co. A, 115 P.V.I. 6 MILLER, Joseph J. Co. F, 2 P.V.H.A. 6 MILLER, Joseph L. Co. B, 54 P.V.I. 6 MILLER, Peter Co. K, 206 P.V.I. 6 MILLER, Samuel M. Co. F, 21 P.V.C. 7 MILLER, W. J. Co. G, 54 P.V.I. 7 MILLER, William Co. G, 54 P.V.I. 7 MILLER, William R. Co. F, 21 P.V.C. 6 MILLS, A. T. Co. B, 103 O.V.I. 6 MISHLER, Jacob G. Co. D, 142 P.V.I. 6 MISHLER, Joseph J. Co. E, 93 P.V.I. 7 MISHLER, Noah Co. E, 54 P.V.I. 6 MITCHELL, T. C. Co. D, 4 P.V.C. 6 MITCHELL, William D. Co. B, 133 P.V.I. 6 MIX, Robert Co. E, 69 P.V.I. 6 MOCK, John H. Co. B, 149 P.V.I. 6 MOORE, James Co. G, 3 P.V.I. 6 MOORE, Morris C. Co. G, 206 P.V.I. 6 MOORE, Samuel Co. K, 199 P.V.I. 6 MOORE, Thomas Co. C, 9 P.V.C. 7 MOORE, William R. Co, E, 6 MD. V.I. 7 MORGAN, W. D. Co. M, 2 P.V.H.A. 7 MORRIS, George Co. A, 55 P.V.I. 7 MORROW, James A. Co. B, MD. I. 6 MOYER, George W. Co. F, 1 Bat. C.
6 MUDGETT, D. B. Co. G, 188 N.Y.I. 6 MUNZERT, Fred Co. F, 3 P.V.I. 6 MURPHY, E. D. Co. F, 55 P.V.I. 7 MURPHY, John Co. I, 54 P.V.I. 6 MURRAY, Owen Co. E, 3 P.V.C. 7 MURRAY, Samuel H. Co. I, 11 P.V.C. 7 NAGLE, Adam Co. G, 192 P.V.I. 7 NAGLE, Conrad Co. H, 6 O.V.C. 7 NEFF, Joseph Co. A, 11 P.V.C. 7 NELSON, Elias Co. B, 78 P.V.I. 7 NESBIT, James A. Co. A, 20 P.V.C. 7 NOEL, John C. Co. A, 55 P.V.I. 7 NOLAN, Archibald Co. K, 206 P.V.I. 7 NOLAN, William I. Co. F, 198 P.V.I. 7 NOON, David J. Co. C, 54 P.V.I. 7 NOON, Eph J. Co. K, 206 P.V.I. 7 OAKS, Josiah S. Co. K, 206 P.V.I. 7 O'CONNELL, Patrick Co. C, 55 P.V.I. 7 OGDEN, John S. Co. M, 12 P.V.C. 7 O'NEAL, Richard Co. K, 29 P.V.I. 7 ORRIS, Joseph W. Co. A, 133 P.V.I. 7 OSBORN, W. E. Co. F, 194 P.V.I. 7 OSSENBURGH, Louis Co. B, 7 N.J.I. 7 OTT, Frederick Co. E, 93 P.V.I. 7 OVERDORFF, F. T. Co. H, 12 P.V.R.C. 7 OVERDORFF, Harrison Co. F, 55 P.V.I. 7 OWENS, Noah Co. F, 54 P.V.I. 7 OYLER, George Co. H, 54 P.V.I. 7 PALMER, George Co. F, 21 P.V.C. 7 PALMER, William A. Co. F, 21 P.V.C. 7 PARFITT, Thomas Co. C, 55 P.V.I. 7 PATTERSON, Hiram Co. C, 20 N.Y.I. 8 PATTERSON, William P. Co. F, 55 P.V.I. 7 PAUL, Elias Co. B, Em. Bat. 7 PAUL, George S. Co. C, 19 U.S.I. 7 PAUL, Sylvester Co. C, 51 P.V.I. 8 PECK, William Co. A, 133 P.V.I. 7 PEDEN, Henry L. Co. F, 21 P.V.C. 7 PEKROD, Samuel Co. C, 9 P.V.C. 8 PENROD, Frank Co. A, 54 P.V.I. 7 PENROD, George W. Co. B, 133 P.V.I. 7 PENROD, Gillien Co. C, 54 P.V.I. 7 PENROD, James D. Co. F, 21 P.V.C. 7 PENROD, Jeremiah Co. F, 21 P.V.C. 8 PENROD, William Co. G, 11 P.V.C. 7 PETRIKEN, Henry B. Co. K, 3 P.V.I. 7 PICKWORTH, Robert Co. G, 3 P.V.I. 7 PLATT, William Co. H, 1 U.S.C. 7 POTTS, Thomas Co. A, 54 P.V.I. 8 PREALL, C. F. Co. K, 82 P.V.I. 7 PRICE, John W. Co. M, 12 P.V.C. 8 PRICE, William Co. K, 3 P.V.I. 7 PRINGLE, Alex. B. Co. D, 5 P.V.H.A. 7 PROSSER, Josiah Co. E, 114 P.V.I. 8 PRUNKARD, Henry Co. G, 192 P.V.I. 7 PURDY, Robert Co. B, 13 P.V.C. 8 PYATT, James B. 9 P.V.R.C. 8 QUILLIEN, John Co. D.
8 QUINN, James Co. K, 3 P.V.I. 8 RAGER, Isaac Co. F, 2 Bat. 8 RAGER, Thomas M. Co. C, 19 U.S.I. 8 RAMBLER, L. D. Co. H, 201 P.V.L. 8 RAMSEY, Dicen Co. B, 110 P.V.I. 8 RANDOLPH, George F. Co. K, 3 P.V.I. 8 RAYMON, J. D. Co. C, 52 P.V.I. 8 REA, James H. Co. M, 15 P.V.C. 8 REAM, Isaac Co. H, 55 P.V.I. 8 REAM, Jacob Co. H, 51 P.V.I. 8 REAM, Samuel Co. K, 149 P.V.I. 8 REED, George W. Co. I, 135 R.V.I. 8 REED, Harrison Co. I, 137 P.V.I. 8 REED, John H. Co. D, 128 P.V.I. 8 REED, Oliver Co. I, 206 P.V.I. 8 REED, OTTINGER Co. B, 133 P.V.I. 8 REES, David G. Co. B, 133 R.V.I. 8 REESE, John D. Co. M, 2 P.V.H.A. 8 REESE, John G. Co. G, 14 R.V.C. 8 REESE, Thomas D. Co. M, 2 P.V.H.A. 8 REESE, William N. Co. G, 192 P.V.I. 8 REIGHARD, Edward Co. C, 54 P.V.I. 8 REIGHARD, John M. Co. F, 198 P.V.I. 8 REPLOGLE, Jacob Co. G, 93 P.V.I. 8 RESSEBERGER, Jesse Co. D, 5 P.V.H.A. 8 RHOADES, Joseph Co. D, 1 P.V.H.A. 8 RHOADES, Samuel� Co. F, 21 R.V.C. 8 RHOADES, Samuel H. Co. F, 21 R.V.C. 8 RHOADES, William D. Co. E, 2 Bat. Em. 8 RICKABAUGH, Jeremiah Co. I, 77 P.V.I. 8 RIDER, John Co. A, 56, P.V.I. 8 RILEY, B. C. Co. G, 3 R.V.I. 8 RILEY, C.� W. Co. A, 54 P.V.I. 8 RINEBOLT, George Co, K, 136 R.V.I. 8 ROBERTS, I. E. Co. F, 198 P.V.I. 8 ROBERTS, John D. Co. A, 2 Bat. Em. 8 ROBERTS, N. I. Co. A, 2 Bat. Em. 8 ROBERTSON, G. W. Co. H, 12 P.V.I.R. 8 ROBINSON, R. P. Co. C, 54 P.V.I. 8 RODGERS, Wallis Co. B, 202 P.V.I. 8 RODGERS, William A. Co. K, 136 P.V.I. 8 ROTH, Christian Co. B, 82 P.V.I. 8 ROUDABUSH, Benjamin Co. K, 206 P.V.I. 8 ROYER, John L. Co. A, 133 P.V.I. 8 RUGH, John C. Co. C, 190 P.V.I. 9 S:IKER, Samuel Co. A, 57 P.V.I. 9 SAGERSON, Robert Co. E, 11 P.V.I. 8 SAXTON, W. C. Co, I, 211 P.V.I. 8 SAYLOR, F. P. Co. E, 16 U.S.I. 9 SAYLOR, George A. Co. A, 133 P.V.I. 8 SCHAFFER, William Co. H, 7 N.Y.I. 9 SCHMITT, John Co. D, 5 P.V.H.A. 9 SECHLER, William H. Co. A, 11 P.V.I. 9 SEELEY, John Co. F, 28 P.V.I. 9 SEES, Noah Co. H, 171 P.V.I. 9 SEESE, Gillian Co. K, 136 R.V.I. 8 SEESE, Joseph W. Co. A, 12 P.V.C. 8 SEIGH, John W. Co. F, 21 P.V.C. 8 SELL, George Co. K, 206 P.V.I. 9 SELMOTH, John Co. C, 19 U.S.I. 8 SERLOUIS, Peter Co. G, 192 P.V.I. 9 SHAFFER, Jeremiah Co. A, 10 P.V.I.R. 9 SHAFFER, John V. Co. F, 198 P.V.I. 9 SHANK, Jacob Co. A, 56 P.V.I. 8 SHANK, Michael G. Co. E, 184 P.V.I. 8 SHANK, Samuel Co. A, 28 P.V.I. 9 SHARP, Henry Co. G, 149 P.V.I. 9 SHARP, Joseph C. Co. F, 194 P.V.I. 9 SHARRATTS, Jacob R. Co. H, 10 P.V.I. 9 SHEARER, John Co. G, 3 P.V.I. 9 SHEHAN, Paul Co. F, 21 P.V.C. 9 SHERMAN, W. M. Co. A, 1 P.V.H.A. 9 SHOMO, John W. Co, K, 177 P.V.I. 8 SHOUP, Samuel Co. K, 102 P.V.I. 9 SHRIEBER, M. E. Co. G, 90 P.V.I. 9 SHUCK, Eli Co. K, 5 P.V.H.A. 9 SINGER, Frank H. Co. A, 2 W. VA.
9 SINGER, James M. Co. G, U.S.I. 8 SINSEBAUGH, James L. Co. D, 11 P.V.I. 9 SITER, Edward Co. G, 3 P.V.I. 9 SITMAN, John P. Co. G, 171 P.V.I. 9 SLATER, William H. Co. K, 3 P.V.I. 8 SLICK, B. F. Co. K, 206 P.V.I. 9 SLICK, W. S. Co. D, 138 P.V.I. 8 SLICK, William A. Co. B, 54 P.V.I. 9 SMITH, Conrad C. Co. K, 136 P.V.I. 9 SMITH, Daniel Co. I, 6 U.S.I. 9 SMITH, David Co. G, 93 P.V.I. 9 SMITH, Henry Co. H, 3 U.S.I. 8 SMITH, James Co. K, 136 P.V.I. 8 SMITH, James S. Co. A, 61 P.V.I. 9 SMITH, John W. Co. I, 10 P.V.I. 9 SMITH, L. L. Co. H, 193 O.V.I. 9 SMITH, Miles N. Co. E, 138 P.V.I. 9 SMITH, R. E. Co. H, 27 ME. V.I. 8 SMITH, S. J. Co. F, 21 R.V.C. 8 SPANGLER, Peter Co. G, 88 P.V.I. 8 SPEEDY, B. F. Co, I, 20 P.V.I. 8 SPIRES, Harrison Co. I, 135 P.V.I. 9 SPRINGER, Joseph Co. G, 206 P.V.I. 9 STEM, William Co. K, 61 P.V.I. 9 STERN, John B. Co. A, 54 P.V.I. 9 STEWART, Caleb Co. G, 14 P.V.C. 9 STEWART, James S. Co. H, 12 P.V.I.R. 9 STEWART, John C. Co. D, 78 P.V.I. 8 STEWART, Joseph G. Co. F, 206 P.V.I. 9 STIBICH, Michael Co. G, 84 P.V.I. 8 STICKLER, Adam Co. G, 99 P.V.I. 9 STICKLER, George Co. C, 9 O.V.C. 8 STIFFLER, John Co. G, 11 P.V.C. 9 STIFFLER, Joseph Co. M, 12 P.V.C. 9 STILES, John Co. D, 11 P.V.I. 8 STILLMAN, George Co. G, 18 Ind. V.I. 9 STOCKMAN, Conrad Co. F, 102 P.V.I. 9 STOMBAUGH, John Co. B, 133 P.V.I. 9 STONEBRAKER, Joseph H. Co. I, 1 MD. V.I. 8 STORK, Edward D. Co. G, 3 P.V.I. 9 STORMER, John Co. F, 21 P.V.C. 9 STORMER, Peter Co. F, 3 P.V.I. 9 STRAUSS, David Co. F, 3 P.V.I. 8 STRAYER, J. J. Co. E, 98 PA. Infty. 9 STRAYER, John G. Co. E, 54 P.V.I. 9 STREMMEL, August Co. D, 139 P.V.I. 9 STUDENY, George 31 N.Y.I. 8 SWAN, Samuel N. 12 ILL. I. 9 SWANK, George T. Co. B, 71 N.Y.I. Co. D, 27 Conn. V.I. 9 SWANK, Jacob J. Co. D, 42 P.V.I. 9 SWARTZENTROVER, Perry Co. B, 2 P.V.I. 9 SWEET, James Co. B, 103 P.V.I. 9 SWEITZER, Lewis Co. K, 22 KY.V.I. 9 TANTLINGER, Daniel Co. F, 21 P.V.C. 9 TAYLOR, John T. Co. E, 186 P.V.I. 9 THOMAS, George W. Co. B, 5 P.V.H.A. 9 THOMAS, Joseph G. Co. I, 54 P.V.I. 9 THOMAS, Peter Co. H, 54 P.V.I. 9 THOMAS, W. J. Co. A, 133 P.V.I. 9 THOMPSON, Fred Co. A, 23 O.V.I. 9 TITTLE, James Co. K, 136 P.V.I. 9 TOMB, James F. Co. H, 12 P.V.R.C. 9 TOMPKINS, James T. Co. D, 21 P.V.R.C. 9 TREMELLEN, William Co. F, 198 P.V.I. 9 TURIS, Edward Co. I, 206 P.V.I. 10 VAN SCOYOC, John Co. D, 192 P.V.I. 10 VANATT, William Co. E, 2 P.V.H.A. 10 VANATTA, James P. Co. F, 21 P.V.C. 10 VARNER, Jacob G. Co. A, 107 P.V.I. 10 VARNER, S. R. Co. H, 54 P.V.I. 10 VAUGHEN, Leander Co. B, 133 P.V.I. 10 VOEGHTLY, Germanus Co. D, 5 P.V.H.A. 10 WAGNER, John� Co. B, 54 P.V.I. 10 WAKEFIELD, Alex. E. Co. F, 2 P.V.I. 10 WALHEIM, Mathias Co. D, 5 P.V.H.A. 10 WALKER, Philip W. Co. F, 21 P.V.C. 10 WALKER, Ronald Co. G, 192 P.V.I. 10 WALKER, William Co. C, 54 P.V.I. 10 WALKER, William Co. K, 3 P.V.I. 10 WALLBACK, Charles Co. I, 206 P.V.I. 10 WARNER, Christian Co. C, 192 P.V.I. 10 WARNER, Pius Co. D, 55 P.V.I. 10 WATERS, Joseph Co. G, 93 P.V.I. 10 WATKINS, Benjamin 51 P.V.I. 10 WATTERAN, J. W. Co. L, 2 U.S.C. 10 WAUGH, James R. Co. A, 29 P.V.I. 10 WAY, Benjamin S. Co. D, 143 O.V.I. 10 WAYLAND, D. B. Co. K, 5 P.V.H.A. 10 WAYNE, W. H. Co. F, 76 P.V.I. 10 WEAVER, H. H. Co. K, 49 N.Y.I. 10 WEAVER, Jacob Co. I, 54 P.V.I. 10 WEAVER, William H. Co. C, 1 MD.V.I. 10 WEDDLER, H. M. Co. F, 54 P.V.I. 10 WEIMER, Samuel Co. D, 47 P.V.I. 10 WENDLE, Charles Co. C, 54 P.V.I. 10 WEST, Emery Co. H, 11 P.V.C. 10 WESTBROOK, N. B. Conn. V.H.A. 10 WHEN, Lewis Co. A, 133 P.V.I. 10 WHITE, John Co. E, 104 P.V.I. 10 WIDMAN, Julius Co. A, 81 P.V.I. 10 WILLETT, H. F. Co. E, 67 P.V.I. 10 WILLIAMS, Hugh Co. F, 198 P.V.I. 10 WILLIAMS, John J. Co. D, 5 P.V.H.A. 10 WILLIAMS, Richard Co. B, 133 P.V.I. 10 WILSON, Albert Co. D, 93 P.V.I. 10 WILSON, D. B. Co. G, 11 P.V.R.C. 10 WILSON, Herman H. Co. H, 54 P.V.I. 10 WILSON, James N. Co. F, 21 P.V.C. 10 WILSON, John C. Co. I, 123 P.V.I. 10 WILSON, John T. Co. I, 1 P.V.C. 10 WILSON, Smiley S. Co. A, 133 P.V.I. 10 WINNICH, Daniel Co. I, 132 P.V.I. 10 WISHART, H. S. Co. F, 77 P.V.I. 10 WISS, Lewis Co. M, 12 P.V.C. 10 WISSINGER, J. P. Co. G, 54 P.V.I. 10 WISSINGER, Sylvester Co. F, 21 P.V.C. 10 WITT, Charles Co. G, 54 P.V.I. 10 WOLFRED, Conrad Co. E, 49 P.V.I. 10 WONDERLEIGH, William Co. I, 137 P.V.I. 10 WOOD, Joshua G. Co. H, 115 O.V.I. 10 WOODRUFF, H. D. Co. D, 47 P.V.I. 10 WORTHINGTON, Isaac Co. M, 21 P.V.C. 10 WOY, John Co. H, 187 P.V.I. 10 WRIGHT, Darwin P. Co. C, 200 P.V.I. 10 WYANDT, Lafayette Co. A, 13 PA. Cav. 10 YOCUM, Samuel Co. F, 198 P.V.I. 10 YOST, Charles Co. C, 17 Ind.V.I. 10 YOUNG, Daniel W. Co. H, 3 P.V.I.R. 10 YOUNG, William H. Co. D, 5 P.V.H.A. 10 ZEIGLER, Barnabas Co. F, 194 P.V.I. 10 ZIMMERMAN, Charles Co. M, 12 P.V.C. 10 ZIMMERMAN, F. K. Co. I, 54 P.V.I. 10 ZIMMERMAN, Jacob Co. K, 3 P.V.I. 10 ZIMMERMAN, Jonathan Co. G, 93 P.V.I. 10 ZIMMERMAN, W. W. Co. C, 8 ILL.C. Page Created: 16 Dec 2005.